Lorenzo Fred Henshaw4,10 [Fred L. Henshaw2,5,8,11,12,13]. 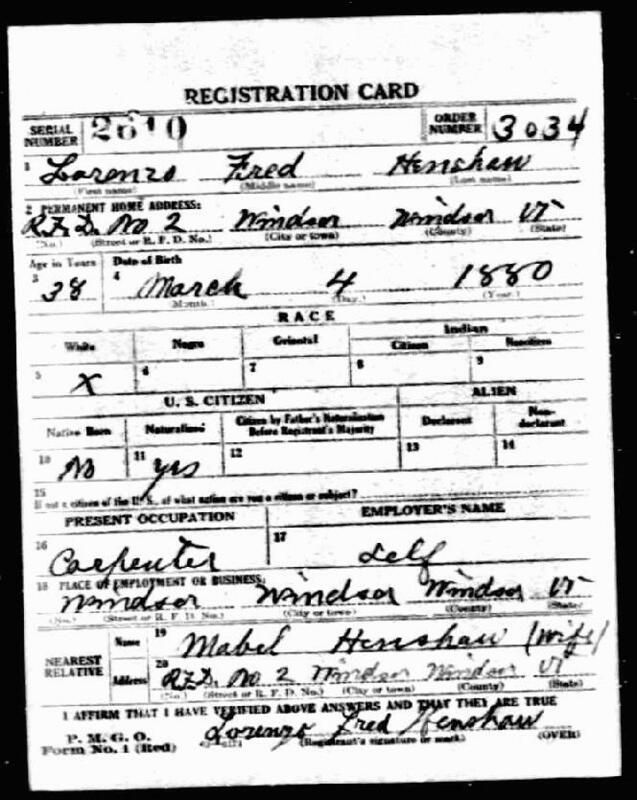 Henshaw, Fred L., head-of-household, age 29, born in Canada; parents born in Canada; immigrated 1902, alien; first marriage, married 7 years; occupation: carpenter, odd jobs; owned home (mortgaged). Henshaw, Mabel, wife, age 29, born in Vermont; father born in Canada; mother born in New Hampshire; first marriage, married 7 years; 4 children, 4 living. Henshaw, Dorothy L., daughter, age 6, born in Vermont; father born in Canada; mother born in Vermont. Henshaw, Thelma M, daughter, age 4, born in Vermont; father born in Canada; mother born in Vermont. Henshaw, Nathalie L, daughter, age 2, born in Vermont; father born in Canada; mother born in Vermont. Henshaw, Syvantis E., son, age 1 year 2 months [unclear], born in Vermont; father born in Canada; mother born in Vermont. Henshaw, Fred L., head-of-household, age 39, born in Canada; parents born in Canada; occupation: carpenter, town. Henshaw, Mabel, wife, age 37, born in Vermont; father born in Canada; mother born in Vermont. Henshaw, Dorothy, daughter, age 16, born in Vermont; father born in Canada; mother born in Vermont; attended school. Henshaw, Thelma M, daughter, age 14, born in Vermont; father born in Canada; mother born in Vermont; attended school. Henshaw, Nathelie B, daughter, age 12, born in Vermont; father born in Canada; mother born in Vermont; attended school. 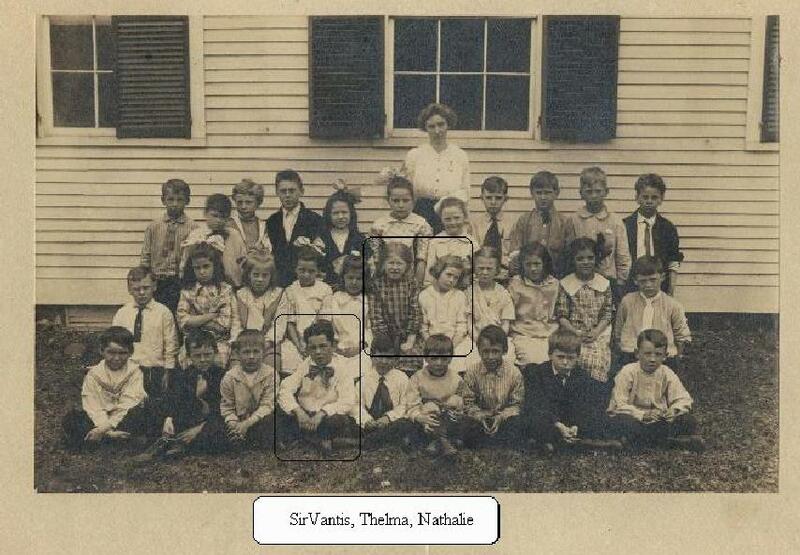 Henshaw, Sirvantis E., son, age 10, born in Vermont; father born in Canada; mother born in Vermont; attended school. Henshaw, Robert F., son, age 8, born in Vermont; father born in Canada; mother born in Vermont; attended school. Henshaw, Garnet C., son, age 7, born in Vermont; father born in Canada; mother born in Vermont; attended school. Henshaw, Fred L., head-of-household, age 50, born in Canada; parents born in Canada; immigrated 190? [unclear], naturalized; first married at age 22; owned home ($10,000 value); radio in home; occupation: carpenter, general building. Henshaw, Mabel L., wife, age 50, born in Vermont; father born in Canada; mother born in Vermont; first married at age 22. Henshaw, Sir Vantis, son, age 21, born in Vermont; father born in Canada; mother born in Vermont; attended school; not a war veteran. Henshaw, Nathelie B., daughter, age 22, born in Vermont; father born in Canada; mother born in Vermont. Henshaw, Robert F., son, age 19, born in Vermont; father born in Canada; mother born in Vermont; attended school. Henshaw, Garnet C., son, age 16, born in Vermont; father born in Canada; mother born in Vermont; attended school. 1910 census, Windsor village, Windsor County, Vermont; roll T624-1618, ED 290, page 290B, line #88, dwelling #212, family #262. Obituary of Dorothy L. (Henshaw) Smith. The Digby Courier, Thursday, June 15, 1961. 1920 census, Windsor, Windsor County, Vermont; roll T625-1873, ED 158, page 33B, line #62, dwelling #55, family #57. "Chicago Daily Herald, Obituaries, 1998-99", Ancestry, Inc.
Obituary of Lorenzo Fred Henshaw. 1930 census, Windsor, Windsor County, Vermont; roll T626-2432, ED 40, page 9B, line #64, dwelling #146, family #181. 1910 census, Windsor village, Windsor County, Vermont; roll T624-1618, ED 290, page 290B, line #94, dwelling #212, family #263.